As part of my annual ritual, I love to choose just one word to act as my guiding mantra and primary theme of the year. It’s amazing how powerful this exercise is, yet it is so simple to do. It works on both a personal and professional basis. When I chose Partnership for 2015, I envisioned forming many powerful business partnerships as well as enjoying my wonderful personal partnership. 2015 Year In ReviewMy one-word theme for 2015 was PARTNERSHIP and, whew, it sure did come true in *so* many ways!!! Check out the blog post: https://www.marismith.com/2015-year-in-review-magical-year-of-travel-speaking-and-partnerships/(I’ll be sharing my 2016 word very shortly! Do you have yours yet? )Video created using the awesome Animoto app. I recently became inspired to dive in to Marie Kondo‘s book The Life-Changing Magic of Tidying Up. Marie developed ‘KonMari’ (pronounced kon-marEE), a powerful Japanese system of decluttering and creating profound order and organization in your home, office and life. See also this insightful article by my friend Beth Kanter about tidying up your online connections and applying the KonMari method to your professional networks! Most of my friends would tell you that I’m already an extremely organized person, very tidy, and very orderly. Another example: my follow up systems with paperwork and business cards could use mega improvement. And, I love a good “spring clean” around my home anyway. When I arrived in San Diego, California back in 1999, I brought just two suitcases with me and let go of everything else I had back in Scotland. I’m so excited to bring more order to my closet, desk, paperwork, files, cupboards, online systems, Google docs (phew! ), email system, guest blogging process, online courses, internal team process… the works!! My goal is to create a much more zen like relationship to my stuff and my day to day life. And to not feel as though I have to constantly be consuming more and more ‘stuff’ – mostly online information! Even though that’s challenging for those of us in the digital marketing industry. Plus, my goal with choosing ORDER as my 2016 theme is to create more space, ease and flow so that I can a) invest my time on only the highest, best and most productive projects and opportunities, and b) free up more time to not work as many evenings and weekends! Say no to everything that doesn’t make your heart sing. 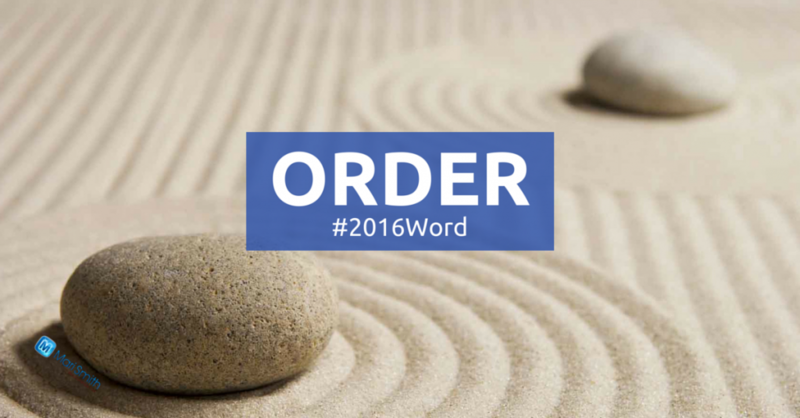 I got inspired to choose ORDER as my 2016 word back in November 2015 when I had had enough of the constant barrage of email clutter. (Can you relate?!) I signed up for Unroll.me and unsubscribed from literally hundreds of mailing lists that I no longer checked. You may also enjoy Sanebox as well. You’ll know when you’ve found your word, as it buzzes with energy! You can envision yourself embodying the word in all kinds of circumstances. You know that you’ll be able to “own” the word for the year. If you have difficulty selecting just one word, let yourself go for two or three. My friend Chris Brogan has also been doing this practice for many years and chooses three words. There are no rules here, folks! Do what’s right for you. Another idea: you might choose one word to represent what you’re letting go of, as well. However, keep in mind that “thoughts are things,” and when you think of something you want to let go of then you’re actually bringing that thing into your awareness. Which, of course, is important to be able to identify, then let go… but don’t keep dwelling on it. Now, it’s your turn – what one word do you feel is the best one to reflect your theme for 2016? Please share in the comments below! I’d love to hear from you.